While at Disney for Princess Half Weekend, Keri and I were able to check out Pasta in the Park. Pasta in the Park is a buffet carb loaded dinner which celebrates runners prior to their big event at Epcot. While all you can eat pasta would generally scare me, I am all about carb consumption before running long distances! 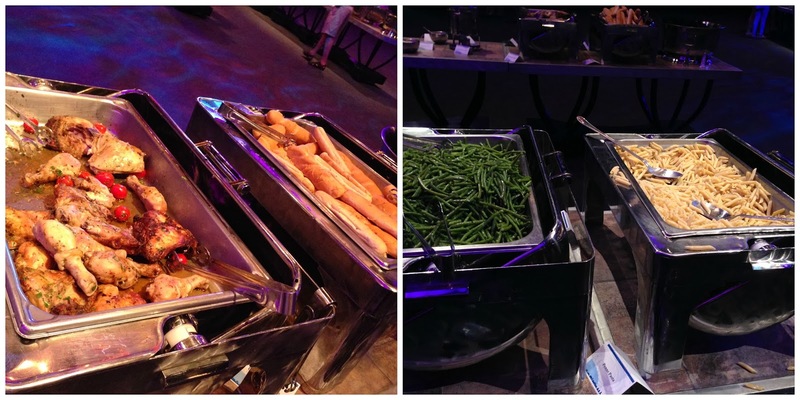 The buffet dinner took place from 7pm to 8:30pm, followed by IllumiNations Reflections of Earth at 9pm. The $52 for adults, $28 for children ticket gets you access into Epcot at 7pm. Once inside of the private Pasta in the Park pavillion, you have access to character meet and greats, a DJ playing top dance music and a few Disney classics, a cash bar for the adults, a face painter of the kids, and of course the Pasta Buffet. Upon walking into Pasta in the Park, the first thing I did gawk was the attendance. The place was packed. I have been to a few work functions at this location over the years but was still amazed to see the turnout. For dinner, we ate salad, roasted chicken, pasta with a choice of marinara and Alfredo sauces, green beans and garlic bread. For a pasta buffet, it exceeded my expectations. And Cinderella's relief, Suzy and Perla. While I was a little sad that we didn't get a photo with Cindy and Charming, I was happy to have another unique Disney photo opp added to my ever growing collection! Prior to Pasta in the Park, Keri and I took advantage of getting other character opps while at Epcot. Minnie and Pluto were located in the Chase Cardholder Character Meet 'N' Greet Private Cardmember Location (which comes with a complimentary 5 x 7 photo)! We then headed over to the character stop for a photo with Mickey, who LOVED my Mickey watch. We also snagged a photo with Goofy, who proceeded to tell us he was at the 10K that morning as well. Pasta in the Park is a perfect opportunity for runners to mingle with others and meet new friends. This event tends to sell out for each race series it is offered, so make sure you sign up if you are interested! Be sure to follow runDisney on Twitter, Facebook and Instagram for events and updates!